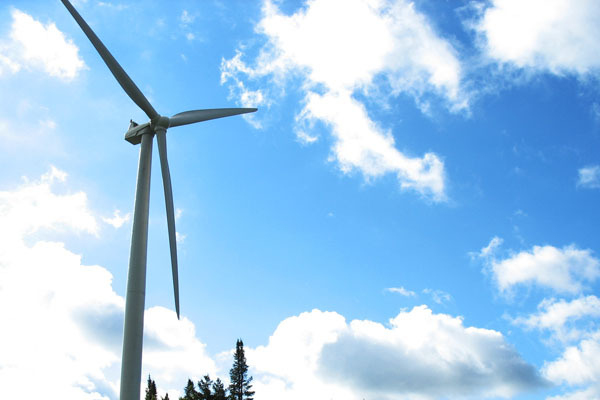 Wind energy is harnessed by wind turbines, which convert the energy of the wind into electricity. Wind energy is one of the largest sources of renewable energy. Wind farms can now be found in more than 40 states. Wind energy is harnessed by wind turbines, which convert the energy of the wind into electricity. Wind energy is one of the largest sources of renewable energy. Wind farms are most effective in areas with high and steady wind speeds, such as the central United States: Texas, Oklahoma, Kansas, and Iowa together produce around half of all the wind power in the country. Wind speed generally increases with height, which is why wind turbines tend to be very tall. What are the advantages and disadvantages of offshore wind farms? What are the major sources and users of energy in the United States? How much U.S. electricity is generated from renewable energy? Coal is a carbon-rich rock formed from plants that grew millions of years ago. Coal is a major source of electricity in the United States and the largest source of energy for electricity generation worldwide. All of the energy we use comes from the Earth, its atmosphere, or the Sun. Some resources are mined or extracted, like coal, uranium, oil, and gas. Others, like wind, solar, tidal, biomass, and hydropower resources, are harnessed at the Earth’s surface. Geoscientists play an essential role in developing energy resources and evaluating their environmental impacts. Geothermal energy is harvested by drilling into underground reservoirs of steam or water heated by the Earth. While western states like California and Nevada lead the country in geothermal energy production, emerging technologies may make it possible to extract geothermal energy throughout the United States. Hydraulic fracturing is a technique used in one step of the extraction of energy resources. Sometimes referred to as "fracking," its wide application over the last decade has led to debate over its risks and benefits. Hydropower uses the energy from moving water to power machines or generate electricity. Used for over two thousand years in water mills, today hydropower is more commonly associated with electricity generation. Nuclear energy is produced from fission, which splits the large atoms of heavy elements like uranium into smaller atoms, releasing enormous amounts of energy. Thirty U.S. states have nuclear power plants, and nuclear energy makes up around 20% of the U.S. electricity supply. Petroleum ("oil") and natural gas are hydrocarbons that formed over millions of years under heat and pressure deep in the Earth. Petroleum and natural gas are the largest sources of energy in the United States. Renewable energy comes from sources that are constantly replenished, like running water, the heat of the Earth, the Sun's light, or wind. Renewables account for around 11% of U.S. energy consumption and 17% of electricity production. Solar energy is energy from the Sun, which can be harnessed in several ways. Solar panels use the photovoltaic effect to generate electricity directly from sunlight. The Sun’s heat can be used directly to heat water or air, or it can be concentrated to boil water, driving steam turbines that generate electricity. This is a review of the history, present and potential resources, and production of oil and gas in West Virginia.